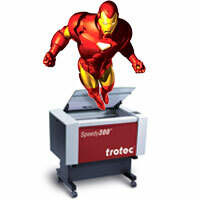 Trotec Laser Online Magazine: Trotec Lasers: Iron Man Approved! Trotec Lasers: Iron Man Approved! Trotec Lasers are cool enough for Tony Stark (aka Iron Man) are they cool enough for you? As our most popular laser system we've always considered the Speedy 300 to be a star! But now it's official... The Speedy 300 has gone Hollywood! Watch the Iron Man 3 preview to see Trotec Laser's Speedy 300 at the 6 second mark and see Speedy 300's full scene in Iron Man 3 in theaters on May 3, 2013!